Rep. Lou Barletta said Thursday that there are more jobs openings than unemployed people in the U.S. There were 6.6 million job openings and 6.1 million unemployed people in May 2018. Barletta, a Republican running for the U.S. Senate in Pennsylvania, mentioned the statistic when he spoke Thursday night at President Donald Trump’s rally in Wilkes-Barre Township, Pennsylvania. “There are more jobs now than people who are unemployed,” he said. 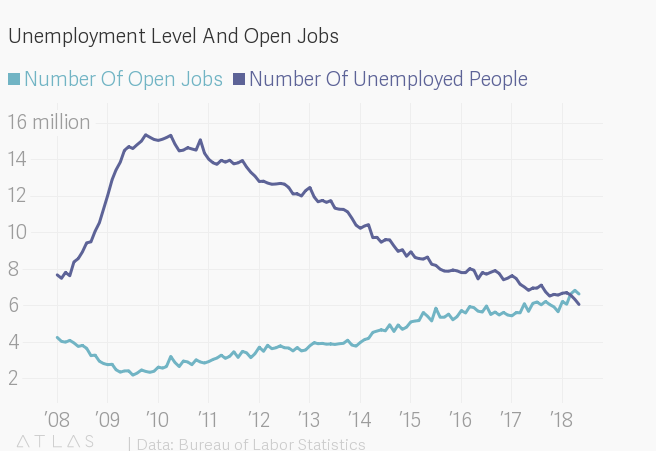 The Bureau of Labor Statistics (BLS) report on job openings and labor turnover said that there were 6.6 million open jobs in May, the most recent month for which that data is available. The bureau’s monthly jobs report found that there were 6.1 million unemployed people the same month. March was the first month that the number of open jobs exceeded the number of unemployed people since the BLS started tracking job openings in 2000. That trend continued in April. It is not yet clear whether Barletta’s claim is true for June and July. The bureau will release its next report on the number of job openings on Aug. 7. Subsequent BLS reports found that there were slightly more unemployed people in June and July than in May. The number of unemployed people rose to 6.6 million in June and then fell back down to 6.3 million in July. While there is a large supply of jobs relative to the number of people looking for work, not all people seeking a job will get one. Some job-seekers do not live in places where there are a lot of employment opportunities, or they do not have the skills that hiring managers are seeking. Some experts worry that means workers are not benefiting from the growth of the economy. Others say that workers may be getting more in terms of other forms of compensation, including better health care coverage. Younger, less experienced workers could also be advancing earlier in their careers as older, higher paid workers retire. “There’s a changing balance of what drives an employee to move to a new organization, and sometimes it’s not always pay,” Bob Wesselkamper, head of rewards and benefits at recruitment firm Korn Ferry, told NPR.